The fine issued to Sir Ken is not unique. 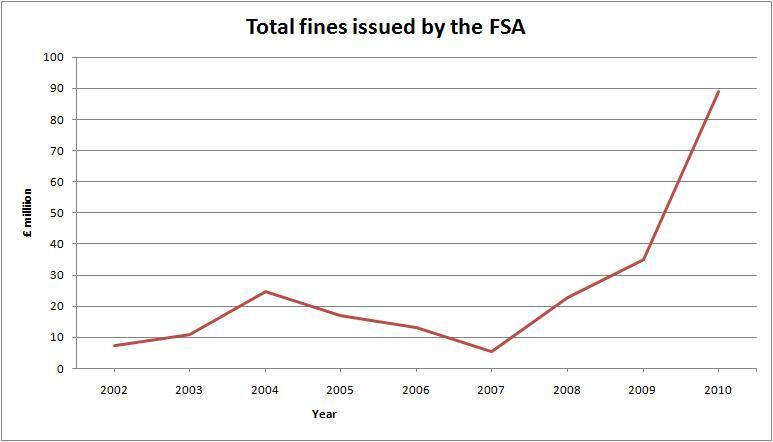 The chart below shows FSA have been handing out more fines since the financial crisis hit. Indeed, the FSA’s records show that last year, they issued £89 million worth of fines compared to £7.4 million in 2002 (the first year for which data are available). The credit crunch saw calls for financial regulators to be given greater powers. Although some new powers have been granted, it is worth noting that the FSA is also using its existing powers to a much greater extent. This trend is visible in other regulated sectors. Other examples of regulators flexing muscles include the continued pursuance of BAA in order to further reduce its influence in the airports sector and the Office of Fair Trading’s (OFT) referral of the concrete and aggregates sector to a Competition Commission enquiry. The upshot of this new, more confrontational style of regulation is that companies are facing more immediate regulatory challenges than previously thought. The days of light touch regulation are over. The big issue for companies operating in regulated industries is how to deal with regulators who will not only have a greater number of powers but also demonstrate a greater willingness to use them.